Tickets are $20 for the general public and $15 for farmers. Price of tickets include pizza & salad, one drink ticket, ice cream, chocolate, music, a raffle ticket, and a donation to FoFF! Additional drink tickets may be purchased for $4. Ages 21 and over. Money raised at this party will fund our Urban Outreach Program which includes events like InFARMation, Fill Your Pantry, hands on workshops like the one with Sandor Katz, farm visits, and much more. It is important that FoFF facilities educational experiences for urban consumers so that they know who is growing their food and with that knowledge, feel empowered to vocalize the kind of food system they want to see in Oregon. We have some awesome silent auction items available for the taking, too! Products have been donated from: Patagonia, Breitenbush Hot Springs, Equal Exchange, Coava Coffee, Naomi’s Organic Farm Supply, Nel Centro, Worthy Brewing, Duck Pond Cellars, Dove Vivi Pizza, and more yet to come! Michael laughed. 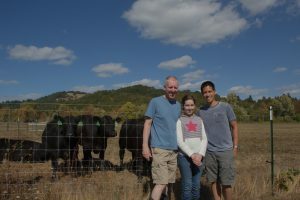 We were in his kitchen, having wrapped up a tour of Verdant Hills Farm, which he has operated with husband Rich and 12-year old daughter Emily since 2013. Around us their 80 acres fanned out like a great skirt – a “throwback” to times when farmhouses stood at the heart of the land which supported them. 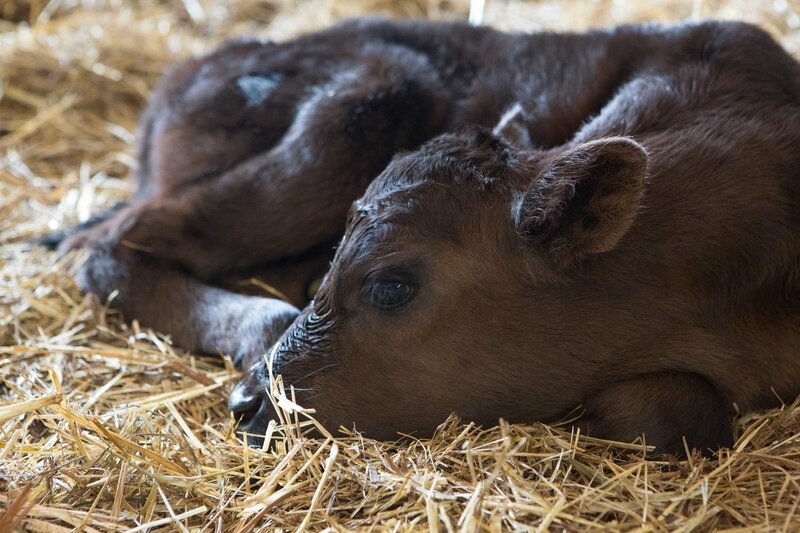 Our first stop on the tour had been to visit the newest addition to the farm: a calf born just that morning, curled up in the “deep bedding” layer of straw in the loafing shed. 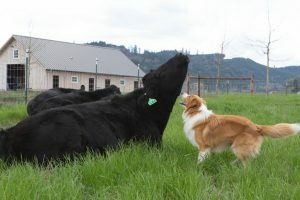 She was joined by the other recently born calves and the new mothers of the season, licking their calves to keep track of which were theirs – as they primarily tell by scent, until the calf picks up its signature “moo”. Beyond the loafing shed in the pasture there was another group of cows with more mature calves, and in a third area – a group of yearlings, born the previous year. They’re approaching the target population of 27 cows: 9 cows, 9 yearlings and 9 calves. They’re a closed herd, meaning no other cows come onto the property; new genetics are introduced via artificial insemination. In today’s confusing and sometimes misleading landscape of labels, Verdant Hills Farm has found strength in directly marketing to customers who can know their farmers and determine if their values align. The core value of the meat production aspect of Verdant Hills Farm is the humane treatment of the animals. Butchering is done onsite by a local certified butcher, and the meat sold by the ¼ cow (vs. by cuts) to avoid sending them off to a USDA-certified slaughterhouse. 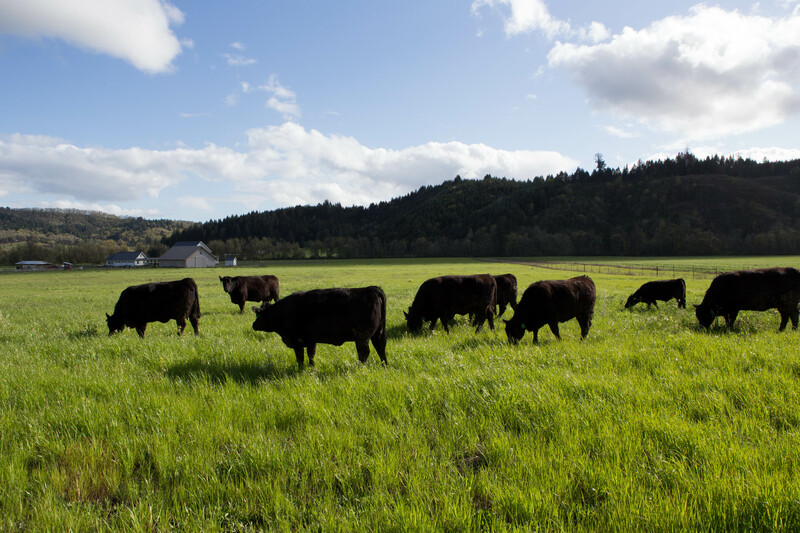 These Angus cows, selected for docility and marbling, are 100% grass-fed using intensive rotational grazing, and all of their feed (pasture and haylage) is produced on-farm. 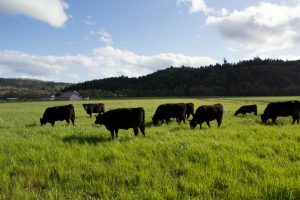 The farm, near McMinnville, previously produced grass seed for lawns, and had to be replanted in forage-grade seed. They’re in the process of transitioning from annuals (ryegrass and clover) to a perennial mix with more forbs (chicory, Boston plantain) and have a no-till drill to accomplish re-seeding with as little erosion as possible. “We look at ourselves as forage farmers first,” asserted Rich. 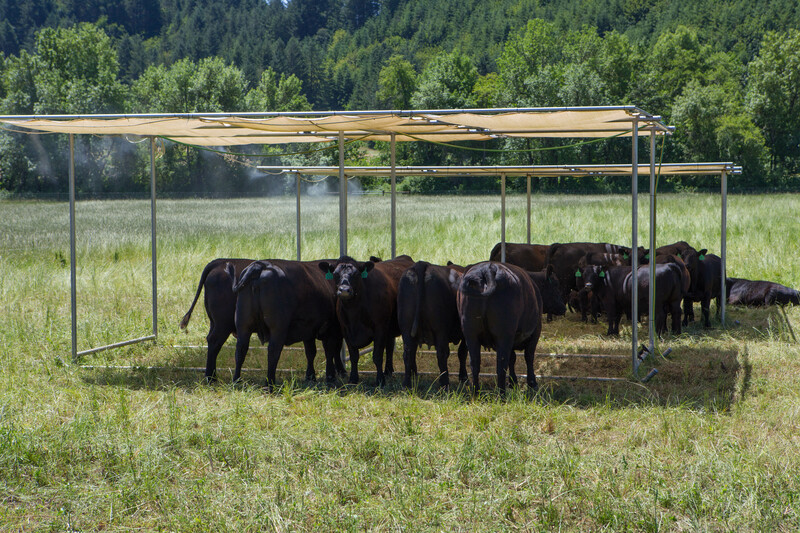 Verdant Hills Farm has recently joined the Oregon Pasture Network, a program of Friends of Family Farmers that works to support the growth of pasture-based farming in Oregon for the benefits of connecting with other producers as well as more potential consumers. We visit the flock of 16 layer hens in the pasture, next to their mobile chicken coop, and toss them a treat of watermelon rinds. Their job is to help control pests (flies) by breaking up the cowpies and eating the fly larvae. They also produce marvelous, orange-yolked eggs; Emily pulls out two this afternoon – one blue and one brown. They are sold at a weekly town drop-off; customers are also able to add on whatever produce is spilling over from the numerous raised beds right outside the kitchen window. Last stop is the beautiful silvery cedar wood barn. The requisite cats are found snoozing atop the remaining strawbale towers – soon to be joined by many more bales in anticipation of winter bedding needs. 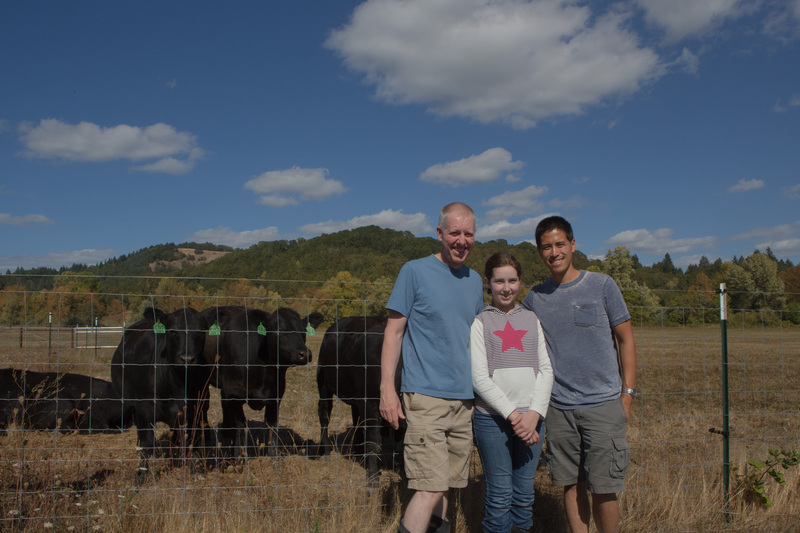 Throughout the farm, Michael, Rich and Emily’s love for their animals and land is evident. From the loafing shed, which has had a passive rain shelter added on to it, to the portable shade structures built to be moved in the pastures to follow the cattle, to knowing just where on the head to give a little scratch – this family loves their animals and the land and life they help support. Verdant Hills Farm embodies the level of care that can and should go into food production – the delicious baby elephant-sized melon they sent me off with is proof positive!